In superconductor hybrid structures, we exploit the competition of superconductivity and different ground states such as normal metals and ferromagnets to investigate devices with potential applications in spintronics and quantum information processing. The structures we investigate are fabricated by e-beam lithography and shadow evaporation in a UHV system. Thereby, contact distances of a few hundred nanometers are realized. We use aluminum, which is superconducting at temperatures below 1.2 K and has a large coherence length, and long spin life-time. The normal metal leads are typically made of non-magnetic copper or ferromagnetic iron. We investigate both local and nonlocal transport properties, and benefit from collaboration with our theory colleagues. Superconductivity and ferromagnetism are antagonistic quantum states, preferring either antiparallel alignment of electron spins (singlet) in the Cooper pairs of classical superconductors, or parallel alignment of spins in ferromagnets. However, the competition of superconductivity and ferromagnetism in nanoscale hybrid structures gives rise to the creation of triplet Cooper pairs. 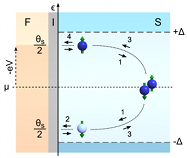 A key ingredient are spin-dependent phase shifts of the electron wave functions at so-called spin-active interfaces. These lead to Andreev bound states, which can be observed as resonances in the conductance of superconductor-ferromagnet nanocontacts. Superconductors are promising candidates for the investigation of spintronics functionality due to the ability to create highly spin-polarized quasiparticle currents and spin-polarized triplet supercurrents, as well as the separation of spin and charge degrees of freedom. Due to the singlet structure of the Cooper pairs, very long spin life-times of quasiparticles are possible. 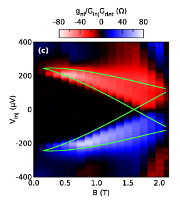 We have recently investigated nonequilibrium charge and spin transport in superconducing aluminum, and observed long-range spin transport in the presence of a large Zeeman splitting. These spin currents are driven by the coupling spin and heat currents, which also leads to large thermoelectric effects. Crossed Andreev reflection (CAR) is a process where an electron entering the superconductor from one normal-metal lead gets reflected into another as a hole, creating a Cooper pair in the superconductor. In the context of quantum information processing, CAR is discussed as a source of spatially separated, entangled electron pairs. 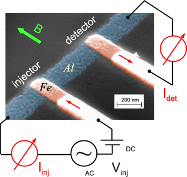 Using ferromagnetic electrodes, we can control the probability of CAR using spin selection of the electron and hole.